Opensource software and online tool for web accessibility. Contrast-Finder finds correct color contrasts for web accessibility. There are lot of tools to find a good contrast on the web, but no one to suggest valid contrasts. Contrast-Finder is a tool which computes the contrast between two colors (background, foreground) and checks if the contrast is valid. When the contrast is not valid, the main target is to suggest some correct colors contrasts. The first one is "valid colors". The result is a wide range of colors. This algorithm is very helpful if you are not sure about the hue of your initial color. The second one is "valid colors and very close to initial color". The result is a list of colors close to the original color. The aim is to have a valid color with a contrast as close to the selected ratio as possible. Contrast-Finder takes his roots back in 2006. As a computer science engineer Matthieu Faure, its creator, saw the opportunity that automation could bring to accessibility, especially to accessible color choices. First lines of code were made in 2006 (project was named CCT), then refactored in 2013 as a Contrast-Finder, a side-project of Tanaguru accessibility checker (supported by a start-up Matthieu created). When the start-up collapsed, the "Tanaguru" brand was lost. In the free & opensource software world, projects and people are more resilient than companies. The opensource license gives an "eternal" life to projects and they use to be more active after their re-birth. MySQL became MariaDB, OpenOffice became LibreOffice, OwnCloud became NextCloud. Logically Tanaguru became Asqatasun, and Contrast-Finder came under its umbrella. 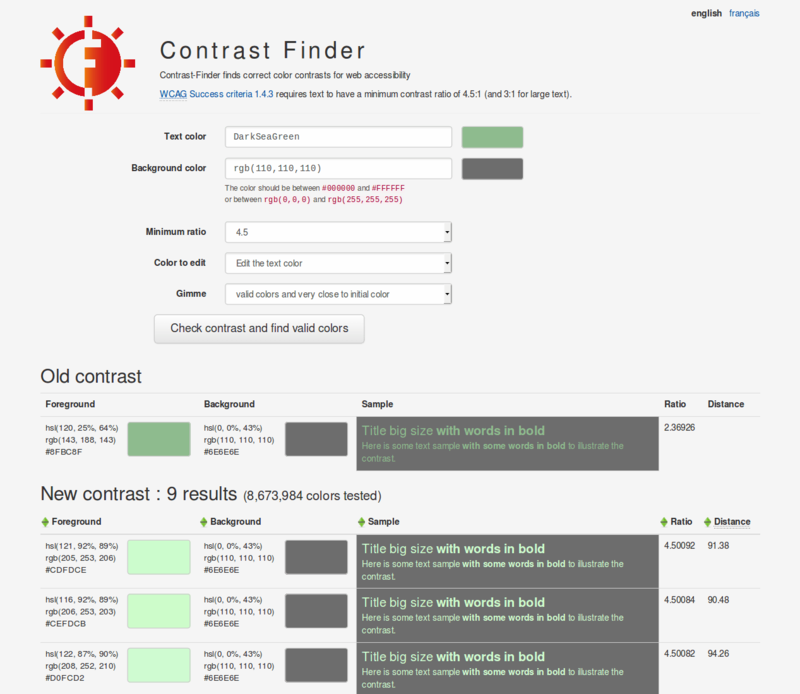 Contrast-Finder is now actively maintained by its community and offers accessible color options for webdesigners.